Everywhere it seems I look online, it's Twitter this and Twitter that. You've no doubt heard about the recent Skittles Twitter campaign. "Just a heads up: Any stuff beyond the Skittles.com page is actually another site and not in our control. This panel may be hovering over the page, but SKITTLES isn’t responsible for what other people post and say on these sites. Click the box below to acknowledge that you know SKITTLES isn’t responsible for that stuff." Twitter attracts a less affluent audience as 49% of users earn less than 60K per year, no doubt a result of the younger user base. While Twitter appears to be the flavor of the week (sorry Skittles people), Facebook continues to experience 22 times more visits than Twitter. Yes that's 22 times more visits to Facebook than to Twitter. So we kow that Twitter is popular in North America and the UK, but what about other parts of the world? 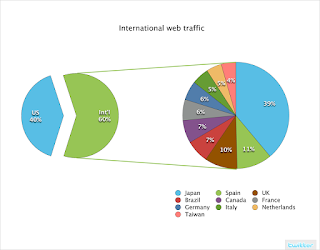 According to Twitter 60% of their traffic is from outside the US, with Japan being responsible for 39%, Spain 11%, UK 10% and Canada 7%. Twitter's global reach will be even greater as they launch in other major markets such as India and South America. The ability to broadcast your stream of consciousness apparently appeals to the masses. Is this really the best way that we can spend our time? Seeking "online fame" by posting updates every 17 minutes on Twitter? If that is the case, feel free to follow us on Twitter @marketing_jive. In all seriousness, do we really want our children spending more time online? Doesn't anyone play sports anymore, or play in a band or do some sort of activity that is not online related? Or is Twitter just a quick way to let us know what you are doing in between those activities? Will the novelty of Twitter continue or will Twitter users quickly become bored and adopt the next online flavor of the week? No offense, but I don't care what the millions of Twitter users are doing and while it's nice to be "in the loop" as to what the people I am following on Twitter are up to, I'd rather be doing something more constructive. It almost scares me to think that the masses are flocking to social networks like Facebook and Twitter. Children are digital natives and are missing out on so many great things outside of these social networks. It kind of reminds me of the song "April 2031" by the band Warrant. I don't quite believe it. The color that it is. And there were cotton candy clouds. And birds to fly through it. Just stories we all love to tell our kids. And keep the cold outside. And hug my aluminium pillow so tight. Doesn't make me sick tonight. No more sky and no more trees. No more oxygen to breathe. No more hate and no more war. Nothing left worth fighting for. Warning: Images in Video Clip may offend some viewers. We should have learned our lesson. And sent our sons away. As they sold more ammunition. Most just looked the other way. And choked off all the land.